This insect monitor that was checked during a routine visit shows a high number of silverfish are present. Although they are not normally considered to be a public health pest, these numbers are clearly too high particularly when found in a sensitive area like a kitchen. The biological life cycle of Silverfish is what’s known as incomplete metamorphosis meaning three stages of development egg, nymph and adult. The young hatch out of the egg and are basically smaller versions of the adult which is why you can see various sizes of the insect in the photo above. At this early stage of development the young are not mature enough to reproduce and will have to go through 8-10 stages of growth before becoming sexually mature adults. The insects were residing in the cracks of a corner floor tile and were treated with a residual insecticide, the cracks were then filled and sealed to prevent the problem from recurring. We always advise clients to keep on top of maintenance by making sure that any cracks or crevices in floor or wall tiles are dealt with appropriately and that areas are kept as clean and damp free as possible. We specialise in the monitoring of sensitive locations such as commercial kitchens and food production factories that require BRC audits, we provide a high quality service that is tailored to meet the specific needs of your business. Call us now to help. 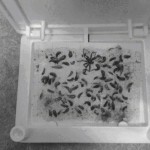 I am the owner of Advanced Pest Management Ltd based in Market Drayton, Shropshire. Advanced Pest Management Ltd specialises in ridding business in Shropshire, Staffordshire and Cheshire of pests in their business premises. We can get rid of birds, rodents, and insects, then proactively control further infection with preventive barriers like mesh screens and flyscreens.